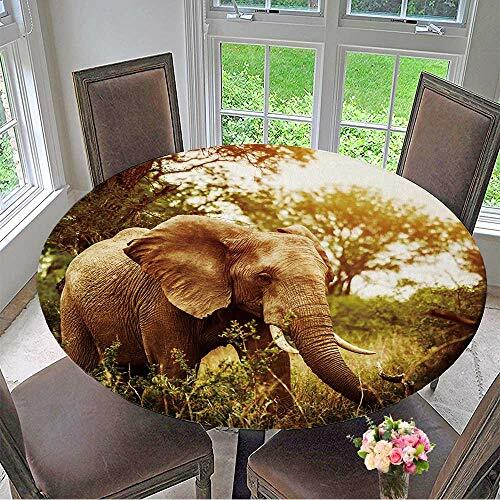 Mikihome The Round Table Cloth Huge Elephant Outdoors,Big Five,Game Drive,African Nature,Beautiful Wild Animal for Birthday Party, Graduation Party 47.5''-50'' Round (Elastic Edge) by Mikihome at Animal Backgrounds. MPN: SBYZB-DL-32-01743D130xD130. Hurry! Limited time offer. Offer valid only while supplies last. This is a retro and elegant tablecloth, making your dining table unique. Gorgeous patterns, relaxed dining atmosphere, it is worthy for you.